Dozens of Israeli soldiers invaded, Friday, the courtyards of the Al-Aqsa Mosque in occupied Jerusalem, and assaulted the Palestinian worshipers, wounding at least forty of them, in addition to abducting twenty others. Medical sources said at least 40 Palestinians suffered various cuts and bruises, in addition to the severe effects of teargas inhalation, after dozens of soldiers, accompanied by groups of extremist colonialist settlers, stormed the courtyards of the holy site, and started their assault by attacking its guards. The sources said that most of the injuries were caused by Israel’s gas bombs and concussion grenades, while many of the wounded suffered minor cuts and bruises. They also stated that several injured worshipers were rushed to Palestinian hospitals in occupied Jerusalem. 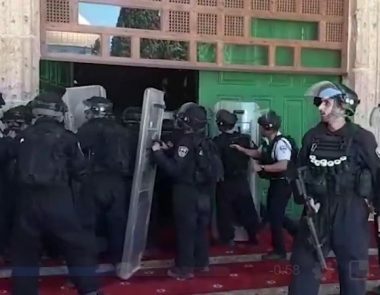 The Palestinian Waqf and Endowment Department slammed this serious violation, and said that the soldiers resorted to the excessive use of force against the worshipers and the guards, wounding 40, in addition to abducting many others. The Ministry said that, the fact that this invasion was carried out on a Friday, while the mosque and its courtyards were packed with hundreds of Muslim worshipers is a serious escalation, and an act of provocation. The Ministry stated that the soldiers turned the holy site into a war zone with their extensive fire, and the use of excessie force against unarmed worshipers. It added that the army also carried out another serious violation and escalation by closing the Dome of the Rock and the al-Qibli Mosque with chains and iron bars. The Palestinian worshipers protested this serious violation, and forced the army to reopen the gates of the Al-Aqsa Mosque, on Friday evening. The army then withdrew from the mosque and the surrounding areas, after abducting twenty Palestinians. Sheikh Mohammad Hussein, the Grand Mufti of Jerusalem, said that attack was part of ongoing and serious violations against the holy sites, and constant desecration of the mosque. Sheikh Hussein added that the attack also came on the first anniversary since the Palestinian managed to foiled Israel’s attempts to permanently install iron and electronic gates around the holy site.